Hello, I’m Heidi, a qualified medical herbalist. 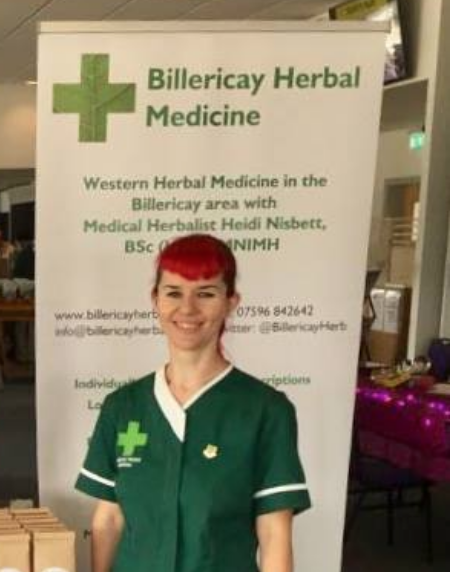 I take one-to-one consultations where we discuss your health needs and prepare a bespoke herbal prescription made of a mixture of herbs to suit your requirements. We also discuss diet and lifestyle. I am fully trained to work alongside any orthodox medication you may already take and to check for any possible interactions. Please have a read of my website or Facebook for more details. I’m also available for talks for organisations/events. Aromatherapy massage, deep tissue massage, reflexology, Indian head massage, Hopi ear candling, Reiki, Bach flower remedies. Hutton, Brentwood and surrounding areas. Osteopathy, cranial osteopathy, homeopathy, osteoporosis screening, sports & soft tissue massage. Shiatsu, Shin Tai and Tai Chi. Healing, Meditation, Life Coaching, Colour Healing, Crystal Healing, Angel Energy Healing. Geopathic Stress detection & removal. Advice on Electro-magnetic fields, Space Clearing, Clutter Clearing, 9 Star Ki Astrology, Feng Shui Placement. Workplace lunchtime nutrition workshops, 7-week tailored nutrition support, weight management support with evidence based approach, Group healthy eating sessions, 1:1 health & nutrition consultations, healthy dietary plans based on individuals needs. Allergy & Food Intolerance testing, Spiritual Healing, Rahanni Celestial Healing, Flower Essence therapy, Holistic Massage, Healing Courses. Maldon, Chelmsford and surrounding areas.